Time to update my charts. Here are two old ones and two new ones. First is how we stand in the Southern Division of the IL. We are still two games ahead of Gwinnett, but you will note that as we’ve been losing, they’ve been winning (five in a row). 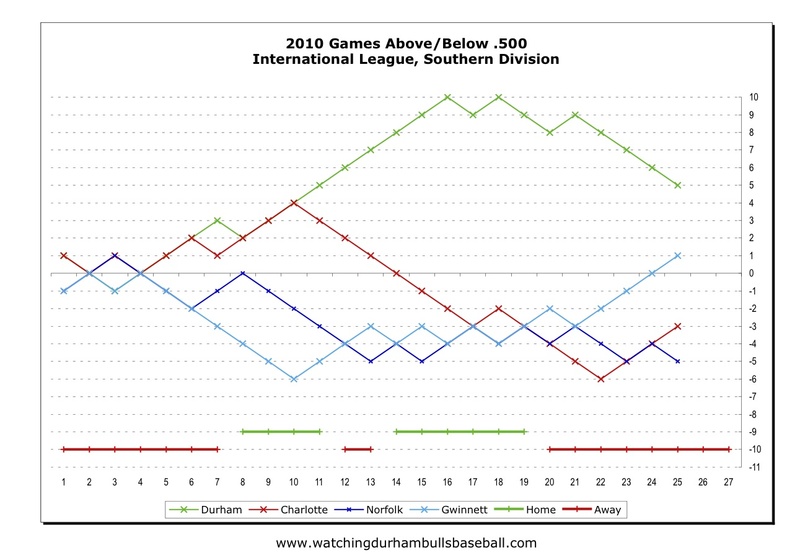 Charlotte has stopped its long slide as well. So the division looks to be, as usual, competitive. 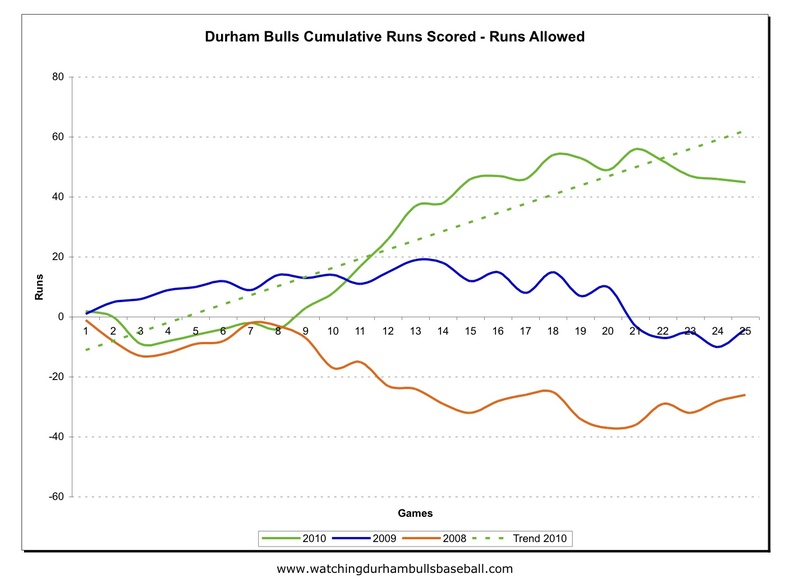 Second up is the runs scored/runs allowed chart. That shows that, for what it’s worth, although we’ve been losing, we haven’t been getting blown out. Previous chart is here. Third up is the wOBA (remember wOBA?) chart. Previous chart is here. 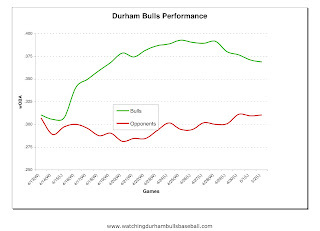 What this appears to be showing is that the decline in our offensive performance (the green line) has been the key factor in our recent losses. The defense (red line) is holding its own, although it has certainly been better. 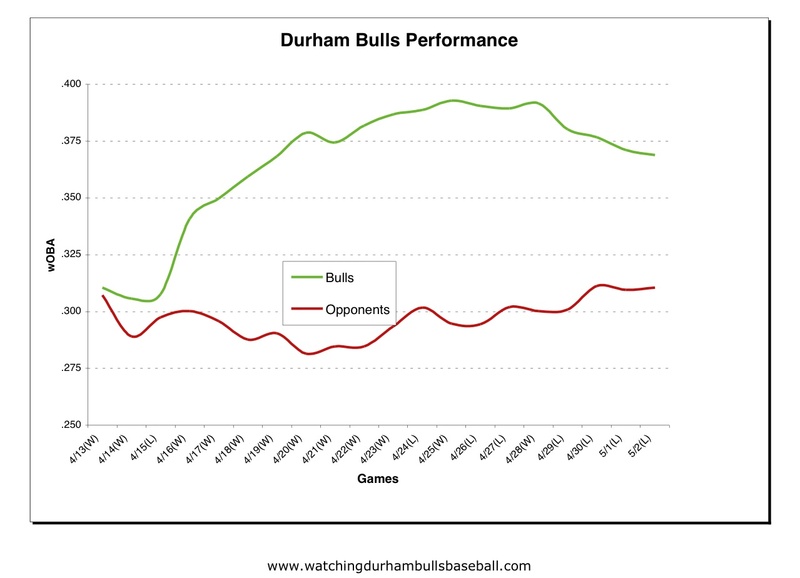 Note that this is showing the last 20 games. As plate appearances go up, we are up to 996, these curves should vary less and less. Our interest is really in the gap between them. 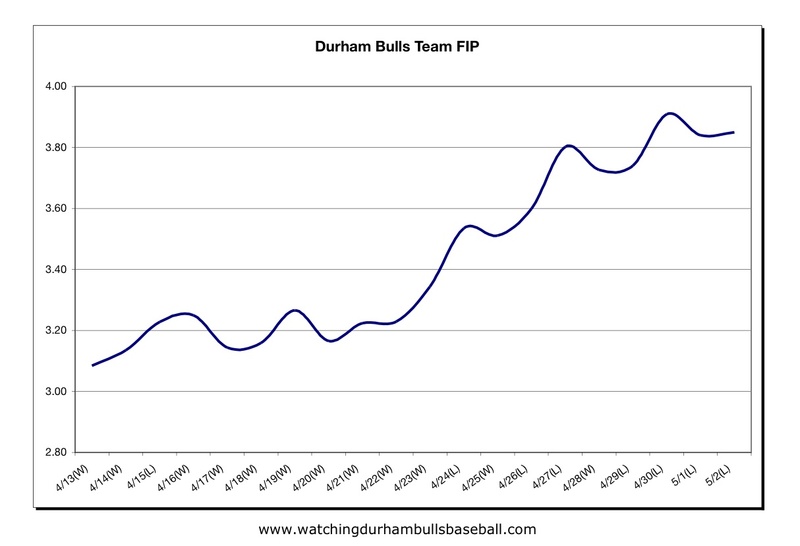 Last is a new chart that plots team FIP. Fielding Independent Pitching is another one of those new sabremetrics stats. It deals with the problem that a pitcher can’t influence what happens when balls get into play. Another way to say it is that FIP strips out the vagaries of a scorer’s opinion regarding “earned” runs. 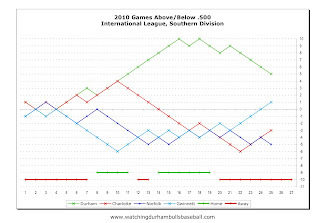 From a purely statistical approach the numbers plotted here have a problem in that the “constant” for the International League has not been computed (or if it has, I haven’t found it). 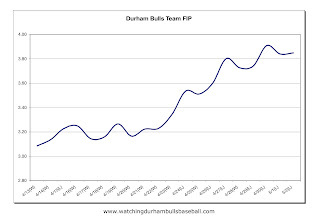 For this chart, that doesn’t matter since we are looking at team FIP and we are only concerned with changes in FIP, not the actual number. What this shows is that our pitching has really slipped in the last week (the larger the number the poorer the pitching). 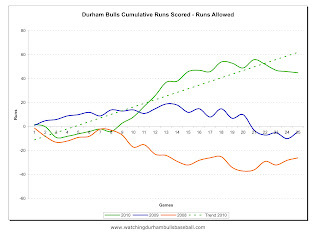 Especially with the last two charts the small sample size caution applies.